Guitarist, generally in heavy rock company - but sometimes displaying his fondness for the blues. For example in The Moody Marsden Band. Led by Marsden and Mick Moody: another tough rock guitarist with a heart full of blues - and a fellow guitar player in Whitesnake. Band is featured on belatedly issued "The Time Is Right For Live" - a double CD on CASTLE COMMUNICATIONS. Part electric blues classics and originals, part acoustic music recorded in Hell (yes - it's a Norwegian town!). In 1998 Messrs. Marsden and Moody led - probably still lead - a band called (The Company Of) Snakes. Bernie Marsden was also one of the enlisted guitarists on Chick Churchill's album 'You And Me', issued in 1973. Chick Churchill is of course the keyboardist of Ten Years After, and the album did feature Ric Lee and Leo Lyons a.o. Babe Ruth (1975, 1976), Paice, Ashton & Lord (1977), Whitesnake (1978), Cozy Powell (1979). Plus a live stint with UFO. I said heavy rock company! But since we focus on his bluesy side: He has more recently issued a CD centered around Peter Green classics: "Blues and Green". 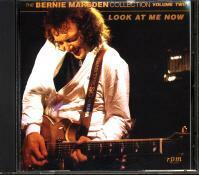 Bernie Marsden appeared on stage at the Alexis Korner Annual Memorial Concert on May 5 1997. Blueprint Magazine wrote: "Bernie Marsden belied his rock pedigree with a spirited romp through some Blues classics including 'The Supernatural' dedicated to his friend Peter Green." On the Road with David Coverdale - lots of Whitesnake info! a page from Kathy's Zak Starkey Site: "The Moody Marsden Band"